Of all of the species of bees, just four are considered honey bees. One of these, “Apis Mellifera” is kept and bred by beekeepers in the UK. Honeybees are social insects, they live in a colony of many thousands of bees. Each bee does a small proportion of the work needed to support the colony, whether that be nursing young bees, collecting food, or building and cleaning the hive. 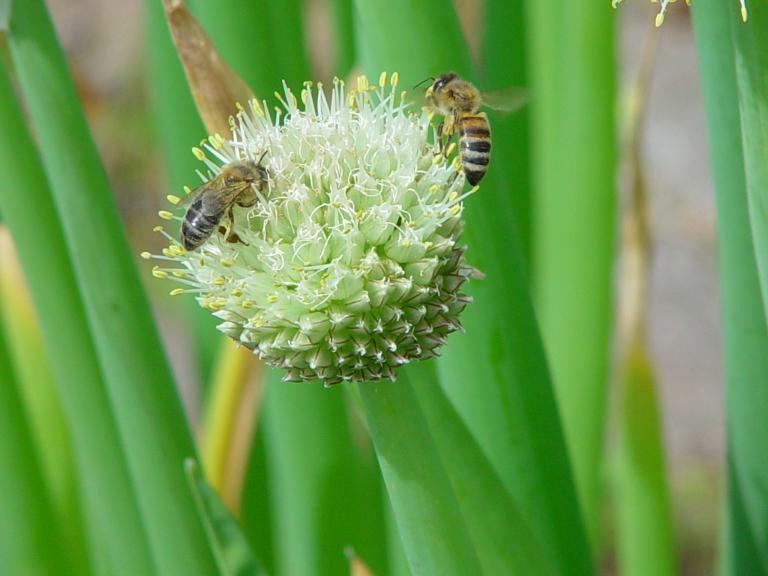 Honey bees collect nectar and pollen from flowering plants and trees for their food. From the nectar they produce honey, which is their main source of energy. 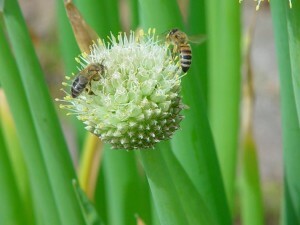 The pollen is mainly used to provide the protein source that young bee larvae need to build their bodies. Honeybees create large quantities of honey so that they have stores to see them through the winter months when it is too cold for them to fly and there are not many flowering plants around. By selective breeding, beekeepers have created bees that make much more honey than they need, so the surplus can be removed for us! Older bees can secrete a wax from their bodies which is used to build the honeycomb nest in which the colony lives. The small hexagonal cells of the nest are used for storing honey, pollen, and unprocessed nectar, as well as a incubation chambers for young bee brood. The honey bee colony is made up of a single queen bee, many thousands of worker bees, and a lesser number of drone bees. Under normal circumstances, the queen bee is the only bee in the colony that is capable of laying eggs – all of the other bees in the hive are her daughters and sons. The worker bees are all sterile females, their lifecycle progresses from nursing and maintaining the hive when young, to collecting food and guarding the hive when older. Drones are all male and their sole role in life is to mate with new queens. Worker honeybees can sting, but their stingers have a barb that holds them in place when stung. If they do sting, then the injuries caused to the bee by leaving the stinger behind in the skin are so severe that the bee will die. Hence, honeybees will only tend to sting when their lives or the safety of the colony is threatened in some way. Honey bees are about 1/2 an inch in length, with a slightly furry thorax and smooth abdomen. The abdomen is striped with various colours alternating between either an orange,brown,or white and black. Some honeybees have a completely black abdomen. Drone honeybees have slightly larger eyes and the tip of the abdomen is furry rather than smooth. A honeybee nest is easy to recognise from the large quantities of bees continually leaving and arriving at the nest on a warm day in spring and summer. On warm evenings you may also be able to hear a low hum as the bees fan air through the hive to keep it cool and evaporate water from the nectar to make honey. Like honey bees, Bumblebees are social insects, but they live in much smaller colonies, there may be less than 50 bees in a bumblebee colony. They are organised in a similar way to honeybees with a single queen for most of the year, and a group of female workers and male drones. Bumblebees typically live in nests in the ground, often holes that have been abandoned by mice and other rodents. They build their nest from wax secreted by the queen and by the workers. The wax “pots” that they construct are used to store small quantities of honey and as incubation chambers for the young larvae. The honey stores in a bumblebee colony are usually quite small. The stores are not so important to bumblebees though, because they do not need them to survive the winter, and they are also capable of collecting new supplies in much more adverse conditions than honey bees can cope with. 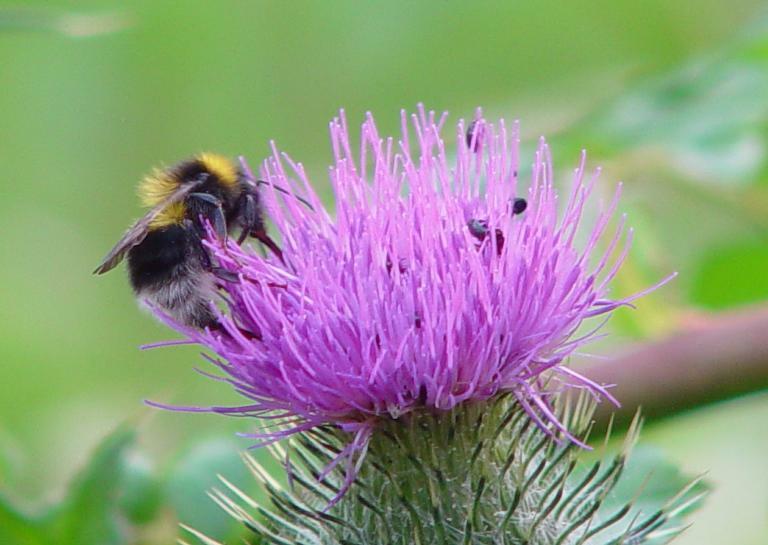 This is in part because bumblebees have a limited control of their body temperature – an unusual ability for insects. Unlike honey bees, the bumblebee colony does not survive the winter as a group. Towards the end of the year, the colony will raise several new queen bees who mate in the autumn and then find somewhere sheltered to overwinter. In the spring, the new queens will look for a suitable nest site and start building and rearing a colony from scratch. Worker and queen bumble bees can sting, but they are very docile and will almost never do so. If their nest is threatened, then they may be tempted to sting, but usually the only time you’ll be stung by a bumblebee is if you sit or stand on one. Bumblebees are about 1/2 an inch in length, but slightly fatter than honey bees with a completely furry thorax and abdomen. The abdomen is striped with various colours depending on species, the stripes can be yellow, white, orange, black or red. There are over 200 species of solitary bees found in the UK, and you might see many of them without even realising you’re looking at a bee or what kind of bee you’re looking at. Solitary bees do not live in colonies like honey bees or bumble bees and all females in the species are fertile. Some common bees you might see are described below. Mason bees live in small holes in wood or masonry. They look quite small and sleek, and are often blue or red in colour. They are good pollinators so some vegetable and fruit gardeners provide nests made of drilled wood or thin cardboard tubes to encourage mason bees to set up home. Mason bees close off the holes that they nest in with plugs of mud, so if you set up nest for them you can tell when some have moved in. Although mason bees can sting, they are very gentle and must be handled extremely roughly to be provoked into doing so. Mining and Mortar bees dig holes in dry firm ground or old masonry to use as nests. They look a little like smaller and less colourful bumblebees. Although mining bees are solitary, if they find a large area of good nest site, then they’ll often build lots of nests tightly packed in a close area, so you might see lots of them around the nesting site. Carpenter bees tunnel holes into wood, and can sometimes cause significant damage to property if allowed to build many nests close together. As such, they are less welcome around the garden and particularly the home. There are several variations in size and colour of carpenter bees, but in general they look a little like bumble bees but with a shiny hairless abdomen. Like mining bees, carpenter bees make make several nests tightly packed into a small area. There are all kinds of wasps, but this section is about the common wasps you’ll see trying to steal the sweet things from your picnic on late summer and autumn days. Wasps are social insects that live in papery nests that they construct from chewed wood. The nest is started in spring by a single queen, and then expanded by the worker wasps to sometimes reach the size of a football by the end of the year. The nest is abandoned at the end of the year. Adult wasps feed on nectar and sugary secretions from the young wasp larvae. They gather aphids and other small insects to feed to their young. In this regard, the wasp is a friend to gardeners in the early part of the year in keeping the aphid population down. When the queen ceases to lay new wasp larvae towards the end of the summer, the adults will look for alternative sources of energy to the secretions of the larvae. This is when they start to bother humans and bees alike, as they invade picnics to steal sugary drinks, or sneak into beehives to steal honey. Only a fertilised queen wasp survives the winter, tucked away somewhere dry. In the spring she will emerge and start the colony building process once again. 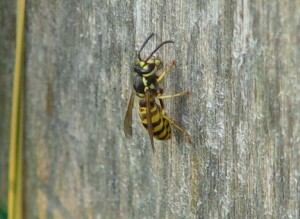 Wasps do not die when they sting, so they can sting repeatedly and they will do so with little provocation. Common wasps are just over 1/2 an inch in length, slightly longer than honey bees. Their head and body are shiny and hairless, and they are covered in bright yellow and black stripes. A wasp nest looks like a grey paper ball, often suspended from a branch or beam. They may also build nests in small cavities in buildings, for example the space between airbricks.